As a youngster, Justin Feldman accompanied his mother to her physical therapy sessions. Now he’s a physical therapist with his own practice, Feldman Physical Therapy, in Poughkeepsie. “I was very interested in science and I knew I wanted to go into something in the medical field; something with a good relationship with patients,” said Feldman, of his early decision to target a career in physical therapy. The employment of physical therapists is rising due to demands of the aging baby boomer population and number of people with chronic physical conditions, according to the U.S. Department of Labor, with 2012’s figure of 204,200 expected to hit 277,700 in 2022. By the time Feldman was a sophomore at Arlington High School, he was preparing to attend Ithaca College’s accelerated physical therapy program, including completing a pre-requisite 100 hours of clinical observation. He got into the school and graduated in 2007 with a doctorate in physical therapy in six years, a year less than the conventional route for the degree. After school Feldman worked as a physical therapist in outpatient clinics in LaGrange,Fishkill and Poughkeepsie for six years. 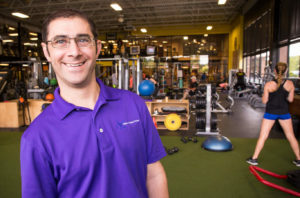 In February 2013, he took matters into his own hands and opened Feldman Physical Therapy in Poughkeepsie, including a treatment room and exercise spaces. Last year, he opened a second site in Fishkill. “I knew the way I wanted to treat people couldn’t be done under the models that were already out there,” he said. Now, instead of short, thrice weekly sessions, Feldman sees one person per hour once a week with the clients doing prescribed exercises at home in the interim. Often, Feldman said, people can go directly into physical therapy to resolve a muscle or joint issue, maintain good movement or for wellness, where intermittent checkups with a physical therapist ensure that a person is moving optimally, whether it’s for everyday movement or a sport-related endeavor, such as running or golf. Jessica Bernier of Salt Point is a former patient of Feldman’s and now sits with him on the Hudson River Rowing Association’s board. Feldman is supportive, encouraging and open to new ideas, said Bernier, and it was no surprise to her that he opened his own practice.